Stefan Ludwik Hahn (born 20.02.1921 in Poznań) during the Second World War was a soldier in the Communication Division of AK. In 1949 he graduated from the Faculty of Electrical Engineering of the Warsaw University of Technology (WUT). At the beginning, he had the position of a teacher and researcher in the Department of Radiotechnical Devices, further transformed into the Instituteof Radioelectronics. His scientific interests concentrated on advanced problems of radiocommunication and resulted in Ph.D. (1958) and postdoctoral (1962). For long years, Stefan Hahn has been a chief of the Radiocommunication Division in the Instituteof Radioelectronics. Development of telecommunication and digital technology in the sixties and seventies, caused a strong demand on new sources of standard frequencies. In that time, under the supervision of Prof. Hahn, an ensemble of high-stability quatrz standards has been elaborated and later applied in the Central Radiostation in Raszyn and Konstantynów. 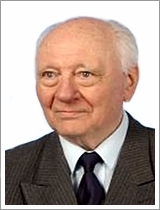 Since 1986 (elected corresponding member of the Polish Academy of Sciences), he developed research in the field of signal theory (especially in multidimensional complex signals) (publications in the Proceedings of the IEEE, IEEE Transactions on Signal Processing, IEEE Transactions on Instrumentation and Measurements, IEEE Transactions on Communications, Bulletin of the Polish Academy of Sciences). In 1991, he retired, but is still very active and continues his research. He is Author of more than 130 scientific publications (120 papers, 6 monographs, including 2 edited in theU.S.A., 4 academic books). He has got 8 patents, including 6 after 1986. He served as a supervisor of 23 doctoral theses. The scientific activity of Prof. Hahn is accompanied with the personal activity in the scientific environment. He has been holding and still holds many dignities, such as the corresponding member of the Polish Academy of Sciences (since 1986), member of the Warsaw Scientific Society (since 1983); President (1993-1996), Vice-president (1987-1993) and member (since 1996) of the Presidium of the Committee of Electronics and Telecommunication of the Polish Academy of Sciences, President of the National Committee of Union Radio-Scientifique Nationale (URSI) (1990-2012). He was rewarded with the Złoty Krzyż Zasługi, Krzyż Oficerski Orderu Odrodzenia Polski, Medal Edukacji Narodowej. He is a prizewinner of several rewards of the Minister of Education (1991), Government Prizes (1966, 1972), 1st order Individual Prize of the Rector of the WUT for scientific achievements (1993) and the Prime Minister Prize for prominent scientific achievements (1998) and many others. Since 1960, Stefan Hahn has participated in the activities of the Polish National Committee of URSI. Thorough his initiative, since 1975 and every 3 years, the National Symposia of URSI have been being organized. Stefan Hahn is the world-famous academic in the field of radio science. He has got the status of the Live Senior Member of Institute of Electrical and Electronics Engineers. Stefan Hahn has always been very sporty, especially in tennis and ski (titleholder of the Master of Polish Academics in tennis). Over many years, he had been the tutor of the Academic Sport Society of WUT (AZS PW), awarded with the gold badge of AZS (1969).